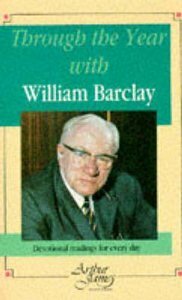 Born 1907 in Scotland, William Barclay studied at Glasgow and Marburg universities. He was ordained in 1933 and inducted to Renfrew Trinity Church until 1946 when he was appointed Lecturer in New Testament Language and Literature at Glasgow University and later to the position of Professor in New Testament and Divinity. In 1956 the Degree of Doctor of Divinity was conferred on him and he held several prestigious academic positions subsequently. Barclay was a theologian, author, editor, lecturer and broadcaster. His Daily Study Bible won international acclaim, and in 1968 he published his own translation of the New Testament. Barclay was married to Barbara and had three children, he died in 1978.